Soldiers from the Royal Anglian Regiment serving in Afghanistan have filmed a cheeky festive video from their base singing along to Mariah Carey's "All I Want For Christmas"
The troops are from 1 Platoon of the 2nd Royal Anglians and are featured performing in various festive costumes. The soldiers said: "We would like to thank all of you for your kind wishes and support this Christmas." The video has now been withdrawn. A soldier from the Royal Anglian Regiment has received the Military Cross for "great courage in the face of the enemy" at an investiture ceremony at Buckingham Palace today. Lance Corporal Lawrence Kayser was awarded the honour for saving colleagues from a "potentially disastrous situation" in Helmand Province in June 2012. The 27-year-old was part of a platoon of soldiers taken by air deep into enemy territory as part of Operation Maahi Buzurg - an attempt to clear a notorious insurgent-held area. On June 21, L/Cpl Kayser found himself just a few metres from enemy fighters hiding behind a wall and risked his life to single-handedly drive them off despite suffering a grenade injury. 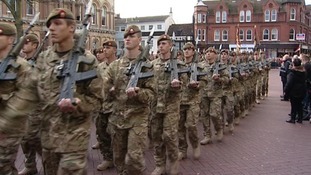 Thousands of people lined the streets of Diss in Norfolk today to welcome home members of the Royal Anglian Regiment. Members of the Royal Anglian Regiment have received the Freedom of the town of Diss in Norfolk today. The infantry soldiers have just returned from their 4th tour of Afghanistan. On Monday they marched through Ipswich. Army commanders and councillors will be meeting in Essex today to publicly sign a military covenant. Members of the county and district councils will be joined by representatives of the emergency services to pledge to work together for the benefit of the armed forces community. The signing comes as members of the 1st Batallion of the Royal Anglian Regiment have returned from their fourth tour of Afghanistan. Yesterday they paraded through the streets of Ipswich. Hundreds have lined the streets of Ipswich to welcome home the Royal Anglian regiment after what could be their final tour in Afghanistan. But today's event won't be the only chance for people to come out and show their support. Hundreds of people have lined the streets of Ipswich to welcome home the Royal Anglian Regiment from their final tour of Afghanistan. Members of the Royal Anglian Regiment are being welcomed home from Afghanistan, as they parade through the streets of Ipswich. People will be lining the streets of Ipswich to welcome the Regiment after its Afghan tour.